It's 5:15 on a Wednesday morning, and about two dozen men are milling around several white cargo vans and a pickup with a wooden camper shell, hoping to be chosen to be crammed inside and taken to a suburban neighborhood. There, the "walkers" will disembark to distribute fliers house to house, rubber-banding them to doorknobs and earning about $50 for six hours of work. None of the day laborers at the Shamrock station on Fort Worth's south side that morning expressed concern that only one of the vehicles had seats behind the driver. They were more upset that the sole Ford Econoline in good condition and equipped with benches and seat belts already had a crew selected. Noting bald rear tires on one van, a laborer named Michael Scannell defended the use of such vehicles, insisting: "We have a pretty good safety record." A 53-year-old man who identified himself only as Fred, and who would end up left behind that morning without work, said he'd climb aboard "as long as the van is safe. If it wobbles and shakes, it's not safe. Anyway, I got to get money somehow, and this is better than robbing banks." 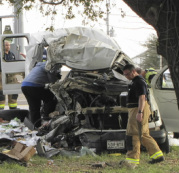 But all the laborers were aware of the March 4 accident that killed three walkers and injured seven others when a similar Econoline cargo van careened out of control on Airport Freeway. Haltom City police said the 1995 van belonging to Fort Worth's Reed Distributing was traveling at normal highway speeds when it burst a tire and rammed into a tree. Found inside were an open bottle of Mad Dog 2020 fortified wine and fliers for a New York-style pizza chain, Carmine's Pizzeria of Dallas and Lewisville. Police have yet to release toxicology results on the injured driver or a final accident report. But they said several of the tires were worn. Mohan "Mike" Sedan, the Shamrock station's Nepalese-born manager, recalled confronting one of the Reed drivers after the accident. "I told him you shouldn't put people in a van like that on the road. He said nothing," Sedan said. "Even in Nepal, we have seats in vans." This may change. Two flier-distributing services not involved in the accident said they are reviewing their use of such vehicles and may install seats. Up until now, the industry has taken advantage of loopholes in state and federal road safety regulations to hold down costs. It's an open secret in the door-hanger advertisement industry that most walkers are typically transported in secondhand cargo vans with no seat belts or, for that matter, seats. "That's pretty much the norm in the industry," said Jim Garner of Cedar Hill-based Always Distributing, a family-owned business founded in 1954. Otherwise, explained Lee Brown, owner of H&H Distributing in Fort Worth, they couldn't pack in 10 people with thousands of fliers. The owner of the demolished Ford Econoline, Paul Reed of Reed Distributing, defended the use of such vehicles. "I am doing nothing against the law at this point," he told the Star-Telegram. As far as carrying people in cargo vans without seats, Reed is correct. Under Texas law, as in most other states, seat belts are not required for adults in a cargo van that has no seats. And while the Econoline owner's manual warns of potential serious injury or death for anyone riding in the cargo area, there's no state or federal prohibition against carrying adults in the back, the Texas Department of Public Safety said. Because there are no seat belts, restrictions on capacity don't apply. And because no one is charged for the transportation, the contract workers who drive the vans are not regulated either. "Tragedies such as these are a reminder that more needs to be done to protect the rights and safety of workers," said Pablo Alvarado, director of the Los Angeles-based National Day Laborer Organizing Network. "Day laborers, like those who lost their lives, go to great risks to humbly provide for their families. Employers must be responsible for their safety during and en route to work." Neil Donovan, executive director for the National Coalition for the Homeless, said he has tried to prevent unsafe cargo vans from cruising for day laborers. "When I operated a shelter in Boston, we would run off vans that came by," Donovan said from Washington. "It's a pervasive problem. I don't think there's a community that doesn't have exploitation. Where there are people who are in need, there are people who take advantage." Flier distributors aren't the only businesses using seatless cargo vans to transport day laborers. Firms that provide cleanup crews at sports stadiums have fleets of battered Ford cargo vans in which workers sit on nothing more than floorboards. Walkers like those involved in the Airport Freeway accident typically cover 10 or 15 miles a day for $40 to $55, said Calvin McDaniel, a homeless Fort Worth resident who has worked for several local door-hanger services. The companies say it is a very cheap but highly effective way for businesses to reach consumers. Only one local firm, Walker Weathersby Advertisements of Arlington, advertises its rates. They start at $149 for 1,000 fliers affixed to front doors. The cost to landscaping services, insurance companies, churches and pizza restaurants is a fraction of the cost of mailing postcards or running newspaper ads. But the business has a sketchy reputation because of concerns that the impoverished workers - paid by the number of pieces distributed - might simply take the money and dump the fliers, said H&H's Brown, a 32-year veteran of the industry who says his own firm has confidential safeguards to ensure delivery. Others say they make spot checks to guarantee a neighborhood's coverage. The low rates in a highly competitive industry mean firms rely on some of society's most desperate workers, who won't question conditions. "You don't think about risks," said McDaniel, 40, who was a walker for about 21/2 years until he switched to cleanup work recently. "You choose money over safety." Early each morning, there's a scramble for the best place to ride inside a cargo van, he said. "I try to get the wheel well hump; otherwise you get scrunched up. But whatever you get, there's nothing to hold on to," McDaniel said. "They know if you are needy enough to get in these vans, they can treat you any way they want." After sweeps of streets near the Presbyterian Night Shelter and south-side boarding houses, vans from several flier services often stop at the Shamrock station on Hemphill Street and hand out advance pay of about $20 for coffee and cigarettes. McDaniel described Reed Distributing as one of the better companies, saying it had never stranded him in an unfamiliar neighborhood, depriving him of his $55 earnings, which he claimed had happened with a rival service. Paul Reed said he intended to pay for the funerals of the three dead workers - James Rice, 51, and Kenneth Johnson, 42, both of Fort Worth, and Karen Guffee, 53, of Mansfield - but declined to be interviewed further for this report. H&H's Brown, who overtly advertises a Christian ethical approach to business and uses an evangelical symbol in his company logo, said he was so shaken by the cargovan crash that he's rethinking the use of seatless vehicles. Only two of the company's five vans now have back rows of seats. "We're in the process of getting seats," said Brown, pointing out several bench seats placed on the pavement behind the H&H building. On Wednesday morning, he said, he found all the brackets needed to convert some GM truck benches for his Ford vans. "We're going to fix all of them up." "You take out the seats because it's hard to fit in 10 guys and the paper fliers. And the law in Texas doesn't require it. When I started out in this business, you sat on a milk crate. That's how paper trucks are." A black milk crate was found among sleeping bags, fliers and a walking cane in the wrecked Reed van, now a designated crime scene. Brown said that his insurance carrier has been told how his contract walkers are transported. "And when we had accidents, the insurance company paid," he said, then conceded: "They may have been injured less if they had seat belts." Although Brown has decided to put in seats, he asserted that they may not have prevented the deaths in the Airport Freeway crash. He noted that one victim, Guffee, was belted in a front passenger seat. Referring to the driver, who survived, he said, "That guy ran into a tree going very fast." "If it's unsafe to ride in a cargo van, why not ban motorcycles?" he asked. "Even motorcycle cops don't wear seat belts." One of H&H's contract drivers, a former walker named Arthur Hughes, 60, said he purposely leased a Ford van with seats "so people will be comfortable. I don't want people flying around. I'm more people-oriented." Jim Garner, who runs Always Distributing said, "We're like everyone else. We use cargo vans." Garner said he too was shaken by the accident, prompting a review of his fleet of five cargo vans. Will he upgrade to seats? "We're looking into it. We're exploring the possibility," he said. But, he added, the several thousand dollars to equip a cargo van with seats would be prohibitive. "As my equipment gets dated, I'll probably go to vans with that equipment already in it, instead of retrofitting." Not all local flier delivery services rely on cargo vans. Two say they use minivans with factory-installed seats and seat belts. Robert Stafford, 45, of Richardson-based Ace Flyer Distribution, said he operates four secondhand Dodge Grand Caravans and limits riders to seven, not 10. "I may be one of the few exceptions in this business," Stafford said. "I will not put people on the floorboards." "We use a van too, but it has seats," said Zakk Weathersby, 25, a former walker who operates Walker Weathersby. "It sounds kind of unsafe not to have seats."